Late in the summer, it’s a constant race to prep fresh garden veggies for sauces and soups, for canning or freezing. 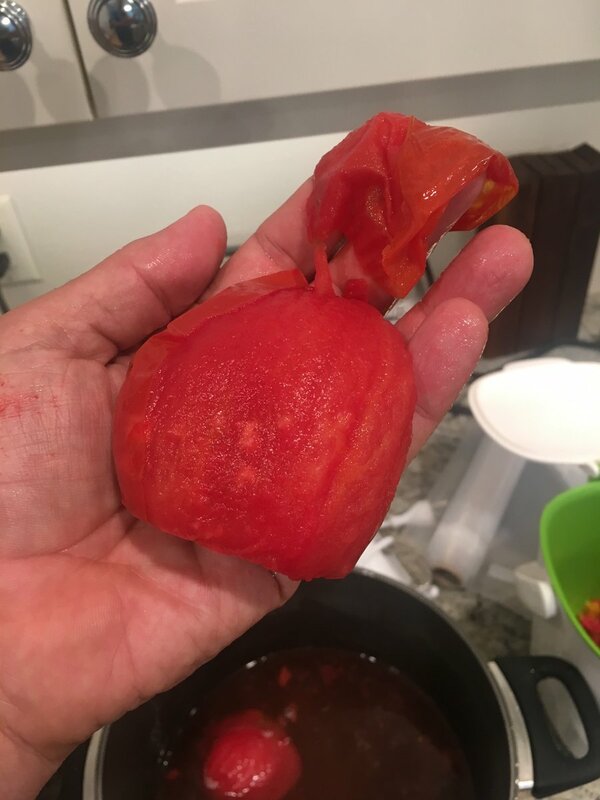 Peeling tomatoes to be preserved isn’t particularly difficult, but it usually involves blanching and ice baths, or fire-roasting – both of which can be time-consuming and messy. Particularly when you’re dealing with 10 or 20 lbs of tomatoes at a time. 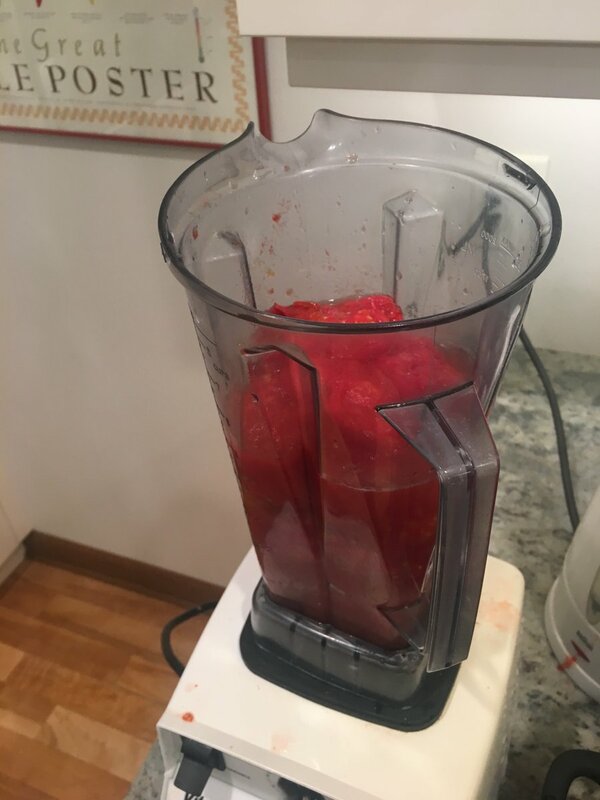 Some people just leave the skins on, but I’m not a fan of that – even mega-blended using something as powerful as a modern Veg-O-Matic, the tiny skin particles that remain bug me, in a sauce. Like an itch that can’t be scratched. Fortunately, I stumbled across a process that has made my late-summer sauce- and soup-making much, much easier. 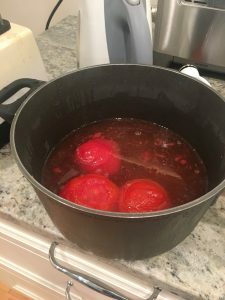 A couple of years ago, before a trip, I had ten pounds of tomatoes, and no time to prep them. So I threw them in a plastic bag, and plonked that straight into the freezer. A *lot* of liquid came out of them. The skins peeled off simply and cleanly. Cut the stems out of the tomatoes. (You can quarter, core and seed them at this point, if you wish). Throw them all in a plastic bag, and freeze them overnight. (I’ll do anywhere between 5 and 20 lbs at a time, depending on day’s harvest). When you’re ready, let them thaw in a large container – a lot of water will come out of them. This is called tomato liquor, and I’m told it’s a great base for soups. This is the liquor from just five pounds of tomatoes. 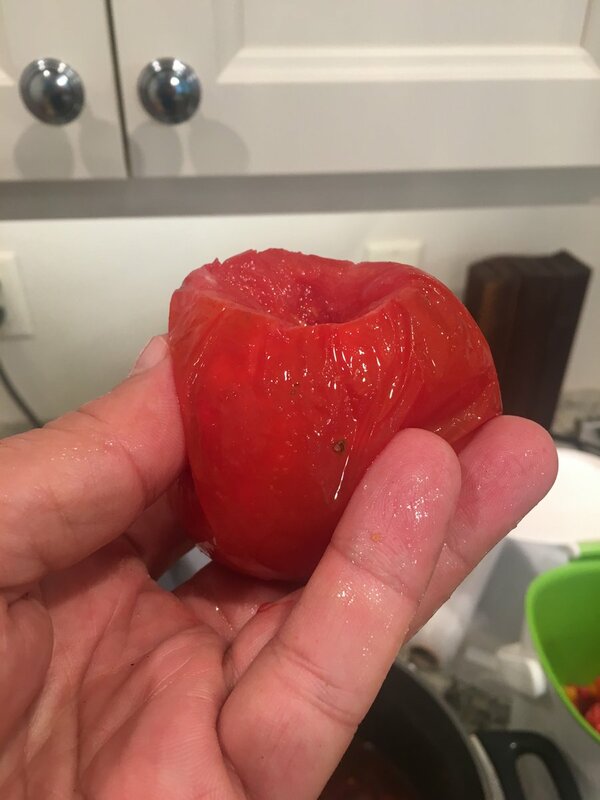 Ummm…and three of the tomatoes. Then all you need do is pick them up…and peel using your fingers! Clean, easy, and dare I say, satisfying. A relatively thick purée results. (Add the tomato liquor back in, if you’re going for a soup instead of a sauce). Add salt, pepper, and/or red pepper flakes to taste. If you’d rather make soup, here’s a genius, crazy-easy creamy tomato soup recipe that lets the wonderful summer tomato flavors shine and sing. 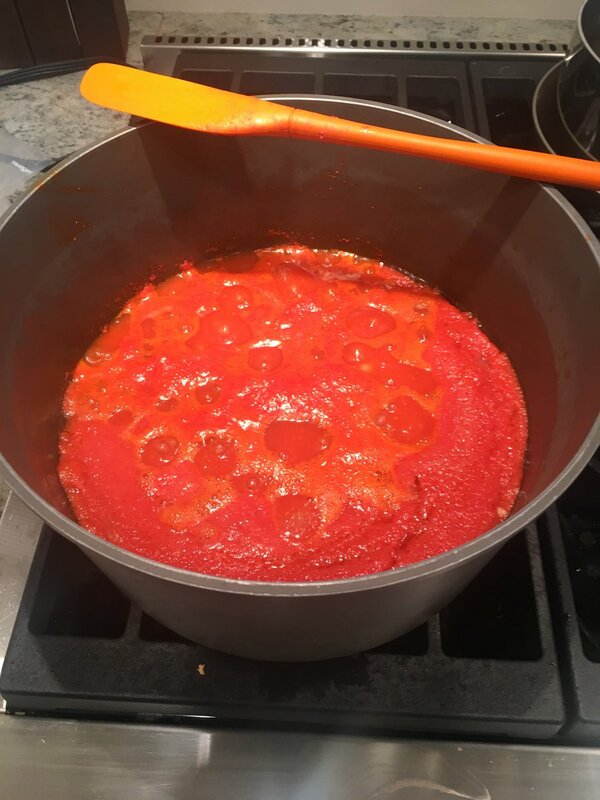 Both tomato sauce and soup freeze well, and I have gallons of each in the deep-freeze by the end of the season, ready to war, the winter months. This prep method saves me a ton of time, as I rush to use the harvest veggies before they go bad. The clean-up is far easier, as well. It almost feels like cheating, actually.